Jessica Bennett of Newsweek aims a gimlet eye and the tween (and pre-tween) beauty industry aimed at convincing your toddler that this is what pretty girls look like. You know, like their moms. Sara Taylor is a 44-year-old divorcée who spends about $7,350 on cosmetic procedures every year just to be able to look at herself in the mirror again. I do all my own manicures and eyebrow grooming at home, and I shave instead of waxing. That way, the money I save can be spent on the cosmetic injections. Now, I have Botox every four months and fillers every six to nine months. To me, it's money well spent, because the benefits are clearly visible. She has, by the way, a 15-year-old son who I'm sure has a wonderfully realistic mental portrait of what a gracefully-aging woman looks like and a sense of self-worth that isn't totally couched in his own looks and rather about his intelligence, grace, charm or kindness. Anyway, back to the children of Jessica Bennett's article who are certainly in no way influenced by women like Taylor. Girls today are salon vets before they enter elementary school. Forget having mom trim your bangs, fourth graders are in the market for lush $50 haircuts; by the time they hit high school, $150 highlights are standard. Five-year-olds have spa days and pedicure parties. And instead of shaving their legs the old-fashioned way-with a 99-cent drugstore razor-teens get laser hair removal, the most common cosmetic procedure of that age group. Let's be frank though: it's not like elementary school girls have the money for $50 hair cuts or weekly mani-pedis: these little luxuries and coming straight from Mom and/or Dad's wallet. Four years ago, a survey by the NPD Group showed that, on average, women began using beauty products at 17. Today, the average is 13-and that's got to be an overstatement. According to market-research firm Experian, 43 percent of 6- to 9-year-olds are already using lipstick or lip gloss; 38 percent use hairstyling products; and 12 percent use other cosmetics. 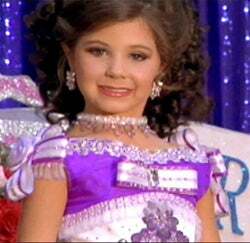 And the level of interest is making the girls of "Toddlers & Tiaras" look ordinary. Consider this: according to a Newsweek examination of the most common beauty trends, by the time your 10-year-old is 50, she'll have spent nearly $300,000 on just her hair and face. That's quite the college education you and her might have been able to pay for (or pay back to Sallie Mae). Eight- to 12-year-olds in this country already spend more than $40 million a month on beauty products, and teens spend another $100 million, according the NPD Group. This trend seems unaffected by the tanking economy: cosmetic surgery procedures dipped slightly last year, but cosmetics sales have increased between 1 and 46 percent, depending on the product, according to the Nielsen Co.
That means the parents (mostly) of children in the 3rd through 7th grades spend half a billion every year on inculcating their daughters with the idea that they are only pretty, presentable or socially acceptable when they are sprayed out and made up. If you add in teen girls, the Beauty Industrial Complex then reaps $1.7 billion from underage consumers every single year. And, naturally, it doesn't stop with make-up and hairspray. New statistics from the American Society for Aesthetic Plastic Surgery show that cosmetic- surgery procedures performed on those 18 and younger have nearly doubled over the past decade. Dr. Alan Gold, the society's president, says that nearly 14 percent of Botox injections are given in the 19 to 34 age group-and while his trade group doesn't break down those ages any more specifically, he's seen a significant increase in the younger end of that group, seeking treatments as preventative. Once again, most 19-year-olds are probably not going to have lying around the $1,300 Taylor spends yearly on Botox alone — at least some goodly portion of those women have got to be getting their Botox funds from their parents. I'm not alone in thinking that this is probably not the best thing in the world. In Susie Orbach's new book, "Bodies," the former therapist to Princess Diana argues that good looks and peak fitness are no longer a biological gift, but a ceaseless pursuit. And obsession at an early age, she says, fosters a belief that these are essential components of who we are-not, as she puts it, "lovely add-ons." "It primes little girls to think they should diet and dream about the cosmetic-surgery options available to them, and it makes body the primary place for self-identity." In other words, girls begin to value themselves more for their own supposed attractiveness, believe that others do the same, and see less value in the other things they might otherwise contribute to the world. But in between the statistics about what some girls and woman will be spending on beauty treatments over their lifetimes, there's one essential fact that is missing from the articles. Companies are creating a lifetime market for themselves by marketing to girls. By creating consumers as such a young age, companies are ensuring that they'll have those consumers — and their money — for life. It's also the only available market into which these companies can expand. It's a hard sell to convince a 31-year-old feminist-y blogger type in the midst of ongoing media massacres that I need to wax my legs, wrap my nails, coat my face in chemicals before I leave the house and keep my highlights up to date, partly because I'm a little too old to care that much and because I never got in the habit of it, thanks to my mother's no-make-up rule and my penchant for sleeping as late as humanly possible. But if, like Bennett, the Beauty Industrial Complex can sell you a "$130 Crème de La Mer face cream I use so sparingly it defeats the purpose of having it" at 27, they figure they'll have less trouble selling you on Botox or laser skin resurfacing for your recessionary job interview in 10 more years. It's straight up-selling — only they're just starting young enough that you don't notice. If A Girl Gets A Spa Treatment And No One Films It, Did It Really Happen?